This is one in a series of tutorials using examples from WINKS SDA. where X is the independent variable, Y is the dependent variable, a is the intercept and b is the slope of the line. Assumptions: For a fixed value of X (the independent variable), the population of Y (the dependent variable) is normally distributed with equal variances across Xs. Related statistics: The correlation coefficient, r, measures the strength of the association between X and Y. Note: This test is equivalent to the test rho = 0 in the correlation procedure. 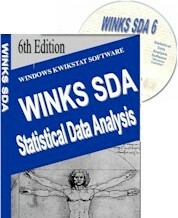 Location in WINKS: Simple linear regression is located in the Regression and Correlation procedures menu. 1. Scatterplot with fitted regression line. 2. Residuals by the independent variable. 3. Residuals by run order. Examination of the graphs is useful to visually verify that the relationship is linear and that there is no pattern to the residuals. If there is a pattern to the residuals, remedial methods may need to be taken for the analysis. Reference: Neter, Wasserman and Kutner. Dependent variable is HP, 1 independent variables, 38 cases.